Sure the day is just about over but that doesn’t mean you can’t use some tips on how to get through the remainder of this love-filled day. February 14th is just another day but it is also the most popular occasion where the media makes some single people feel more lonely and men feeling forced that they must do something special for their mate. I like Charlie Brown will not get sucked into the commercialized hoopla that is Valentine’s Day, and since ole cupid has not struck me with his ancient arrow I’m just going to chalk this day up for what it is. I’m just fine with that. Whether you’re single, in a relationship, newly engaged, engaged for some years now, married, divorced, we all need advice on how to keep it positive. 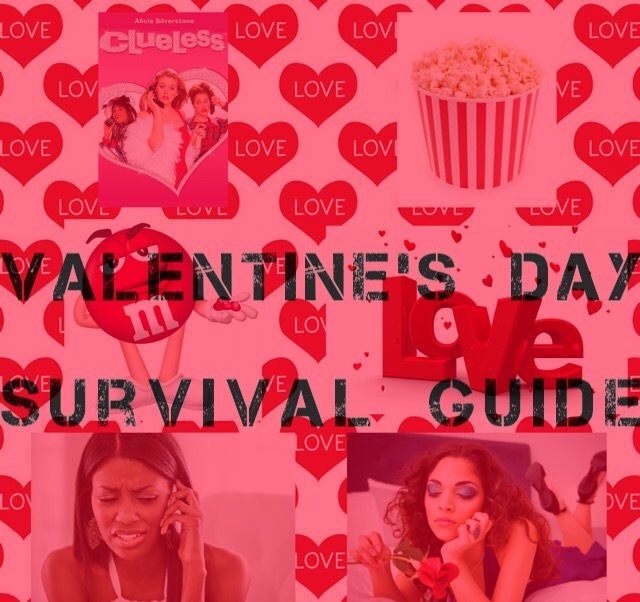 This survival guide will be more purposeful for: The Single Girl, The Girl Who’s Faking It, The Almost Married Girl, and anyone else in between. So before you drop your Cinderella glass slipper of hope or that Saturday night in glass of wine, here are some suggestions to help you keep a love for yourself momentum going even after V-Day is over. Write 2-3 sentences in the notes of your phone a proud moment you had so far this year. Don’t bring the problem past today, confront it. Afterwards treat yourself to something sweet. M&Ms? Focus on the true loves of your life: your family, your child(ren), close friends you can confide in. Inhale positivity, exhale negativity. Repeat. Tell your sweetie you love them. Repeat. Wash your face from the woes of the day and rest up.